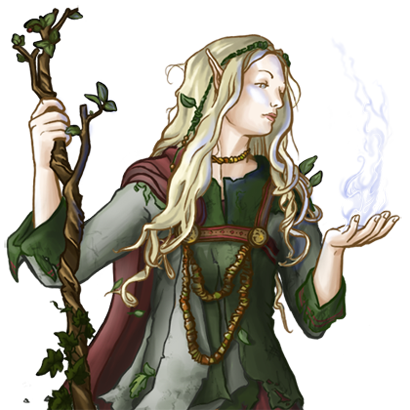 Some elves have studied varieties of magic better suited for offensive purposes. Whence their knowledge and mastery of such arts came is not known, and they do not reveal their secrets. All that is known of their training is that they may spend long time alone in the wilderness, not to appear for years, or in extreme cases, centuries. For these ascetics, knowledge may be a curse at times, as their people tend to expect from them more that what they can offer without violating their own principles. Nonetheless, they may use their mastery of magic to lend a hand to fate- or to twist it. They possess good knowledge of both offensive and defensive spells.